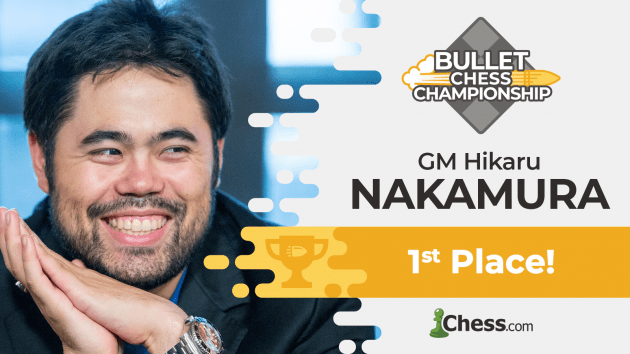 Hikaru Nakamura defeated Oleksandr Bortnyk to win the 2019 Bullet Chess Championship on Sunday. Earlier, Maxime Vachier-Lagrave came third after beating Levon Aronian. This article recaps a full weekend of bullet chess, with the quarterfinals and semifinals played on Saturday and the consolation final followed by the final on Sunday. In the links below you can quickly reach each particular section. After winning the first Bullet Chess Championship qualifier, many fans believed that 15-year-old Iranian GM Alireza Firouzja had the speed to match top-seeded GM Hikaru Nakamura. During the qualifier, Firouzja became the first Chess.com player ever to break a bullet rating of 3300, passing Nakamura on the global rating list. "I don't think anything is going to be tougher than [Firouzja]. If I lose in the semis or the finals, it's completely on me for choking because I would say that Alireza is far and away better than any of the other players in the field." The loss pushed Aronian's lead to four, and Karjakin, who had just beaten Anand earlier in the day in Shamkir, was not able to stage a comeback. With Aronian winning 11-3, the semifinal against Nakamura was set. Some fans may not have heard of Ukrainian speed chess specialist GM Olexandr Bortnyk prior to our Bullet Chess Championship, but after his performance this week Bortnyk is now a household name on our site as well. After dominating the round robin qualifier, Bortnyk was the fourth highest rated bullet player on Chess.com. Bortnyk was quick to build a lead, registering three wins and four draws to kick off the match. The Ukrainian's use of the Alekhine's Defense continued to pose problems for Grischuk throughout the match, as Bortnyk was able to score 4/7 with the Black pieces. GM Federico Perez Ponsa was another tournament surprise, winning the second open qualifier in a field with many top grandmasters. Even with the higher rating, many considered the Argentinian an underdog against GM Maxime Vachier-Lagrave. With Perez Ponsa never leading by more than one point, MVL was always in reach. After tying the match late, the two players entered sudden-death overtime, where Vachier-Lagrave drew last blood, winning the match 8.5-7.5. The win meant the end of an impressive run by the Argentinian grandmaster and a semifinals berth for Vachier-Lagrave. With the final quarterfinal complete, the semifinals were set. With the memory of his quarterfinal match-up still lingering, Nakamura reminded Chess.com of his elite level in bullet by thrashing Aronian. Though Aronian was plagued with internet issues of his own, Nakamura showed his class by building a quick lead and never letting go. Aronian scored some points late - including besting Nakamura's Bong Cloud opening - but it was not enough. The top-seeded Nakamura clinched his spot to the final with a crushing 28.5-6.5 match victory over the Armenian. After watching his quarterfinal win, 82 percent of viewers on Twitch picked Bortnyk to upset Vachier-Lagrave and progress to the Bullet Chess Championship final. The win played into the Ukranian Grandmaster's 7/8 unbeaten run, which proved to be more than enough to upset Vachier-Lagrave, 16.5-12.5. For the consolation final and final, for the first time ever Chess.com tried a tennis style format for the scores. This meant that the first player to reach six wins (with a two-point difference) would take the first set. Draws didn't count for the score. The consolation match was a best of three sets, and the final a best of five. This quickly led to a "mouth slip" by commentator IM Danny Rensch, who accidentally called it a "chennis match" and decided to stick with it. The main difference in this match seemed to be MVL having better mouse skills and also premoving more. For instance, in one game he ended up in a RN vs Q endgame but won it anyway. "As I remember from when I was quite an addict at bullet, playing two pieces against a queen is quite a nightmare for the queen," Vachier-Lagrave said afterward. The Frenchman took the first set 6-2, and quickly in the second set Aronian was getting lost in tactics with the following game being especially amazing. The second set was won 6-0 by MVL, and so this match was over sooner than expected. "I don’t have the practice guys, I’ve never played bullet. I don’t know how to do this premoving business," said Aronian. MVL: "I guess my mouse was just faster and it helped me tremendously in the first set. Then in the second set I even started to play better." "I believe bullet is fun, but there are so many other fun things that can last longer than one minute!" "To tell you the truth I really enjoyed it," Aronian added. "Of course it’s never fun to lose but when it’s fast you don’t get to suffer too much." A nice example is Nakamura not thinking at all about 44.Rb5 and 47.Rc3 in the following endgame; these moves come out naturally and suddenly there's no way White can be stopped from queening. Nakamura took the first set 6-1 (Rensch: "Shame on you for being so good") and continued 6-2 second set (Rensch: "Hikaru sees everything!") and another 6-1 in the third. Only four games ended in draws (which weren't counted). "I had no idea about the tennis score, and found out just before the final. But Hikaru is too strong and too fast. When I am trying to play as fast as Hikaru I blunder and when I try to think, I am low on time very quickly." "First of all, I think if there is a mismatch it’s definitely gonna favor the lower rated player without a doubt. For me it didn’t really matter [here] but if I’d played Alireza in this format or the 30-minute format, it would have been extremely tight. But for me this time around it didn’t make a big difference." "I think it’s gonna be close no matter what. The two people who have a chance against me in any format regardless are Magnus and Alireza Firouzja. If we play a long match it’s gonna come down to a bit of luck at critical moments whether it’s straight up points or whether it’s in this tennis format. I would say I’m the favorite but I don’t think it’s clear at all that I would beat either of them." Let's hope we'll get to see Carlsen and Nakamura playing 1|0 at some point. The Norwegian is committed more strongly to Chess24 now that it was acquired by PlayMagnus, but it has been suggested that some kind of cooperation between the two rival sites to make a Carlsen-Nakamura bullet clash possible, might benefit both. The fans would surely want to see it. Commentary for the Bullet Chess Championship was provided by Robert Hess, Eric Hansen, and Danny Rensch. All shows and archives are available at twitch.tv/chess.